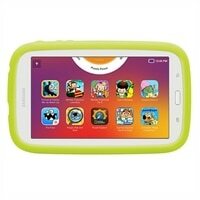 Samsung Galaxy Kids Tab E Lite - 7" 8GB (Wi-Fi) Tablet with Bumper Case - Cream WhiteTab E Lite is designed for ultra portability to carry with ease everywhere. Its concise slim form factor is sure to please. Enjoy the comfortable hand grip, complemented by its extreme light weight - feel the difference! Beautifully compact with long-lasting power - what more could you ask?